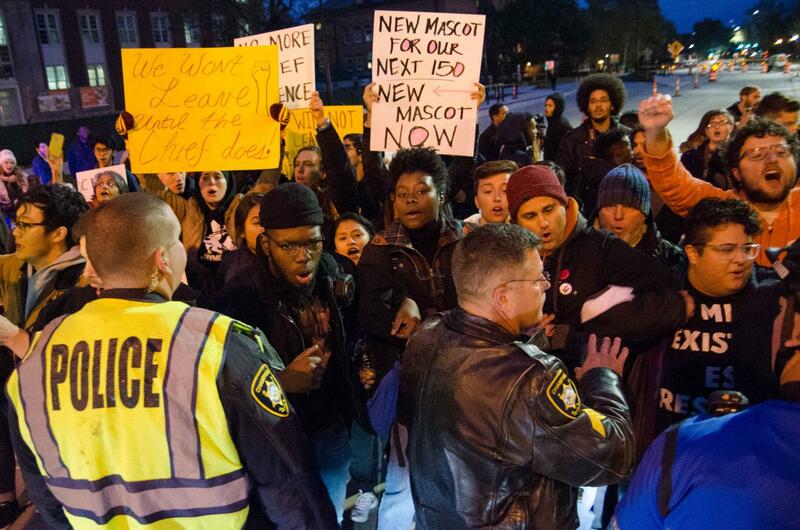 Anti-Chief Illiniwek protesters faced University police officers on the corner of Wright and Green streets after forming a blockade. The protest was organized by the Illinois Student Government and included other student organizations. Last night, the Illinois Student Government called for the University to move forward with creating a new mascot. ISG was flooded with almost two hours of public comment about the organization’s actions regarding the mascot and the Homecoming Parade protests. Senator Rahul Raju, senior in Engineering, proposed a resolution to present the University with a new mascot. In 2016, ISG created a committee that concluded the University was ready for a new mascot. Tariq Khan, Ph.D. candidate in the Department of History, thanked ISG during public comment for standing up against the use of Chief Illiniwek and backing up their words with actions. Khan said the Chief tradition came out of a climate of racism and from the imagination of a white bandleader in the 1920s. Madeleine Hubbard, sophomore in Media and former Illini Media Company employee, said during public comment that the ISG violated Illinois law when it created its own parade without a permit after stopping the Homecoming Parade with its protesting. “ISG can not and should not silence others simply because they do not agree with their beliefs,” Hubbard said. Senator Sully Peterson-Quinn, senior in FAA, said there were 16 student organizations that helped put the protest together. “When we all stand together as a student body we can really make a difference,” Peterson-Quinn said. Student Body President Raneem Shamseldin, senior in LAS, said that what was meant to be a walkalong protest may have turned a little more “spontaneous.” She said she is glad everyone was safe. Raju said he does not want to rehash the discussion of whether this University is ready for a new mascot. He said the committee that was created two years ago came to that conclusion. “We spoke to students, we spoke to faculty, we spoke to alumni, we spoke to business owners, we spoke to student athletics, we spoke to representatives from the Native American House, we spoke to every constituency group that we thought would have an invested interest in this,” Raju said. ISG voted to send the resolution to ISG’s Committee on Campus Affairs. Minik said he is worried about the future of the student government after it sponsored the event that occurred over Homecoming Weekend. Jonathan Heideman, senior in LAS, senator in ISG and president of the Illini Republicans, said what happened at the “Meeting with the Chief” event and previous actions against the Illini Republicans do not bring an inclusive environment. Ivan Dozier, University alumnus and former unofficial Chief Illiniwek, was one of the voices heard during public comment at the meeting.